Nadan Kozhi taste is special unlike the broiler chicken. Broiler chicken needs the added effect of spices,tomato and roasted coconut or coconut milk or any added condiments to add substance to the curry. 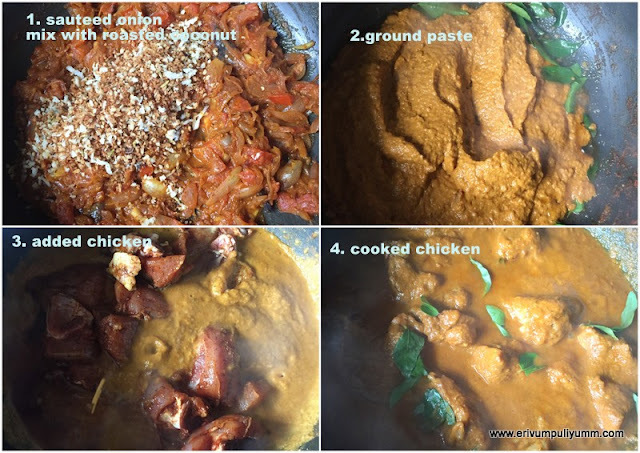 These days I have nearly stopped making the regular chicken curry and have started modifying flavors to the regular chicken curry to make it more flavorful and everyone at home prefers some new recipe with chicken. This is one such recipe that definitely goes perfect with ghee rice, naan or any Indian staples. I didn't know to name this chicken curry and so named it as' special chicken curry'. This recipe is my own trial and error version which just worked well and is running without any flaws. The sauteeing is same like the regular chicken curry but here in this gravy we add whole garam masala . But then this is ground along with some roasted coconut flavor to add that special aroma. This chicken curry is slow cooked to impart the flavors well and then end result is a scrumptious chicken curry, try and check this out ! Wash the chicken under running water,rinse 3-4 times and drain the water completely. Marinate the chicken using the ingredients listed above for an hour. Heat oil in a pan and add the whole garam masala listed above. Add in the ginger garlic paste and saute till the raw smell disappears. Add in the thinly sliced onions and shallots. Saute the onion until its lightly browned. Add in the spice powders on low flame, saute until raw smell disappears. Add in the tomatoes,add few splashes of water and cook covered till tomatoes are mushy and well cooked. Switch off flame and leave to cool. In the mean time,dry roast the coconut with the fennel seeds until coconut is lightly browned. Switch off flame and add to the onion tomato mix. Grind together once its cooled to a smooth paste. You may not require to add water at all but if required add a tbsp to grind to a smooth paste. Heat the same pan used for sauteeing and add coconut oil (2tsp).Add in the curry leaves(1 sprig) and add the paste. Saute on low flame for 2 minutes and then add 1 cup water. Slide in the chicken pieces and let it come to a rolling boil,add salt. Simmer the flame to low and cook covered for 20 minutes on low flame. In between check the gravy,if it thickens considerably add another half cup water,adjust salt. After 20 minutes, when the chicken is well cooked and gravy is thickened switch off flame. Granish with coriander leaves(cilantro) and curry leaves (I haven't used cilantro). Serve warm with naan or ghee rice. We had with ghee rice, pairs perfectly. * I used a mix of kashmiri chilly powder and hot chilly powder but you can always use spices as per tolerance. * I have used chicken with bones but you can use boneless too. * You may get a thick gravy with 2tbsp coconut added but if you wish to have a very thick gravy then go for 3tbsp grated coconut. I always love curry! This chicken curry looks really yummilicious. Dear Julie. I'm very fond of curry and despite, here in Spain is not part of our dishes, it's been used more since blogs share repipes from all around de world. Your kitchen needs a good piece of bread to enjoy.